In May 2017, we recorded an unprecedented drop in the numbers of targeted vital civilian facilities at the hands of the Syrian-Russian alliance. 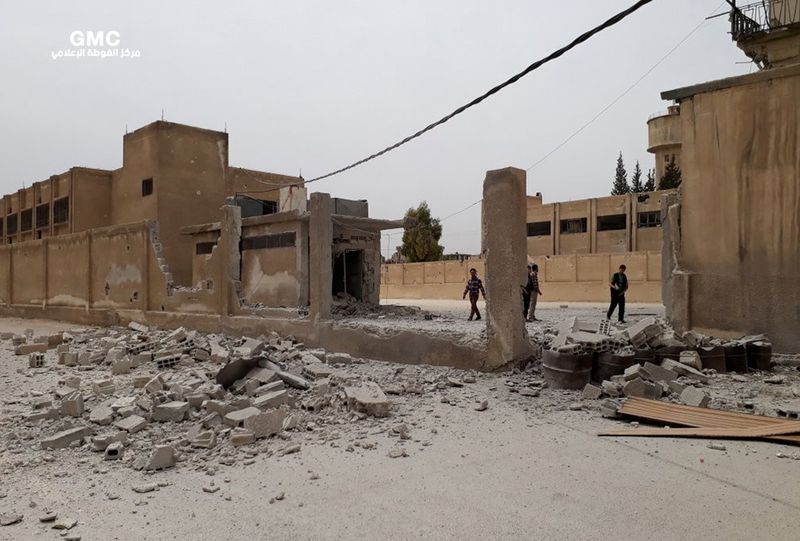 While Syrian regime forces’ attack saw a 65% drop in numbers of attacks on vital civilian facilities compared with last April, Russian forces’ attacks have been at their lowest in May since the start of the Russian intervention on September 30, 2015. In contrast, international coalition’s campaign continues in the east region of Syria which has been the deadliest and heaviest in terms of civilians’ deaths since February 2017. The report documents the incidents of attack on vital civilian facilities in May where no less than 40 attacks against vital civilian facilities were recorded as follows: 14 by Syrian regime forces, two by Russian forces, five by ISIS, one by Self-Management forces, 11 by international coalition forces, and seven by other parties. The report also notes that Russian forces, Kurdish Self-Management forces, ISIS, international coalition forces, and other parties (Includes groups that we weren’t able to identify and the Turkish, Lebanese, and Jordanian forces) have attacked some of these facilities. The indiscriminate random bombardment is a violation of the international humanitarian law and amounts to a war crime.